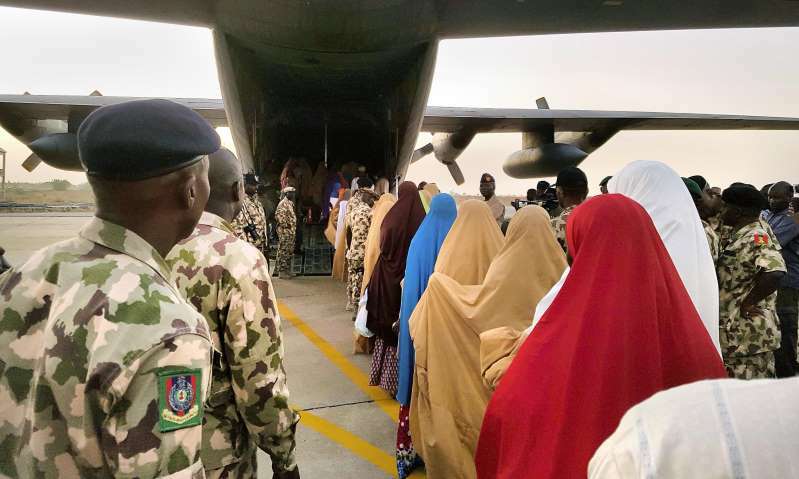 © AP A dispute over the Dapchi girls, pictured after their release from abduction, is believed to be behind the reported death of Mamman Nur. One of the most senior leaders of the violent Nigerian extremist group Boko Haram has reportedly been killed by his own men. Mamman Nur, who is thought to have led one of the group’s three main factions, was killed by some of his close lieutenants on 21 August, according to Nigerian media and other sources. Nur was seen by some as the slightly “softer” faction of the group that has killed tens of thousands of people and uprooted more than two million from their homes. His faction is believed to target the military and the few Christians left in the parts of north-east Nigeria where the group operates, unlike Shekau’s faction which overwhelmingly targeted Muslim civilians. Some reports said Nur was killed over a dispute relating to the Dapchi girls, a group of school students who were abducted in February and later released. Boko Haram began as a movement against the Nigerian government and went underground when its founder, Mohammed Yusuf, was killed after being taken into police custody in 2009. When it was taken over by Yusuf’s feared former deputy, Abubakar Shekau, he turned it into a full-blown armed insurgency, which at one point controlled enough territory that he declared a caliphate. Shekau’s militants notoriously kidnapped the Chibok girls, a group of schoolchildren whose cause was taken up by global figures including the former US first lady Michelle Obama, but those children – many of whom were later released – represented a fraction of the total abducted over the years. As the group lost territory, it increasingly turned to bomb attacks on key towns, frequently sending children strapped with explosives to blow themselves up in busy markets or checkpoints. Shekau has been reported killed many times but later reappeared in videos posted on YouTube. He pledged allegiance to Isis in 2015, but the jihadist group announced a new leader the following year – Yusuf’s son Abu Musab al-Barnawi – and there was a split in the group. Some believe Nur to have been the real power behind al-Barnawi’s figurehead, while others say Nur led an entirely separate faction. Ahmad Salkida, a prominent, well-connected journalist, said his sources had confirmed that Nur was killed. However, vigilante leaders and local hunters, who are among the best-informed sources about changes within Boko Haram and movements on the ground, said it was suspicious that his death was not reported before, when it supposedly happened more than three weeks ago, and warned that the reports should be treated with caution.